I have to admit that my very first time attending Complexity Fest this year was incredible. Needless to say that it’s rapidly becoming one of the most interesting progressive music-focused happenings all around Europe. The festival’s newly announced line-up once again proves why it’s going to be a great weekend once again! Complexity 2019 will take place on Saturday, February 16, 2019, at the Patronaat in Haarlem, one of Netherland’s most intriguing venues (at least in my experience). In comparison to UKTM and Euroblast, the people at Complexity manage to deliver a more diverse, interesting, and astounding line-up, without repeating themselves at all. With the first band wave, we got bands like The Ocean and Shining (playing their seminal album Blackjazz in full), as well as PinioL, Klone, Lotus Eater, The Armed, and Irreversible Mechanism. Now, let’s get to these new names on the billing! It’s super exciting that we’ll get to see Zeal & Ardor headlining the festival. Manuel Gagneux, who can be called a progressive musician in every sense of the word, managed to perfectly combine elements of American blues/gospel with black metal. Him and his band really created something unique with their music, and 100% earned this headliner spot with the release of Stranger Fruit. Among the other bands announced are Sweden’s up-and-coming prog metallers Letters From The Colony, whose record Vignette delivers a modern mixture of Meshuggah, Gojira, and some BTBAM influences. Definitely one of the most promising young prog metal acts of the year! Frontierer guitarist Pedram Valiani’s original band Sectioned will play, too. Their record Annihilated absolutely slays, incorporating punishing grooves and glitch effects that are bound to make you go insane into the band’s chaotic mathcore sound. Another highlight on the new announcement are the UK’s Conjurer, who have played an incredible set at this year’s Euroblast. Their record Mire is one of the most intriguing debut records of 2018, its sludgey and heavy components creating tons of energy that the band are also able to deliver on stage. Serbian guitar master David Maxim Micic will be playing a solo performance, letting Sordid Pink (formerly known as Destiny Potato) rest for the time being. Last but not least we got Inferum, Eindhoven’s finest death metal outfit. As you can already see, we’ll get to experience a very diverse line-up of bands that are all somehow ‘progressive’. And this isn’t even the full line-up! There’s still more to come, which in turn makes me even more excited! After a fantastic edition in 2018 with bands like SikTh, VOLA, and The Faceless, 2019 might even top this going by these two band waves. Get your tickets soon, they’re quite cheap! 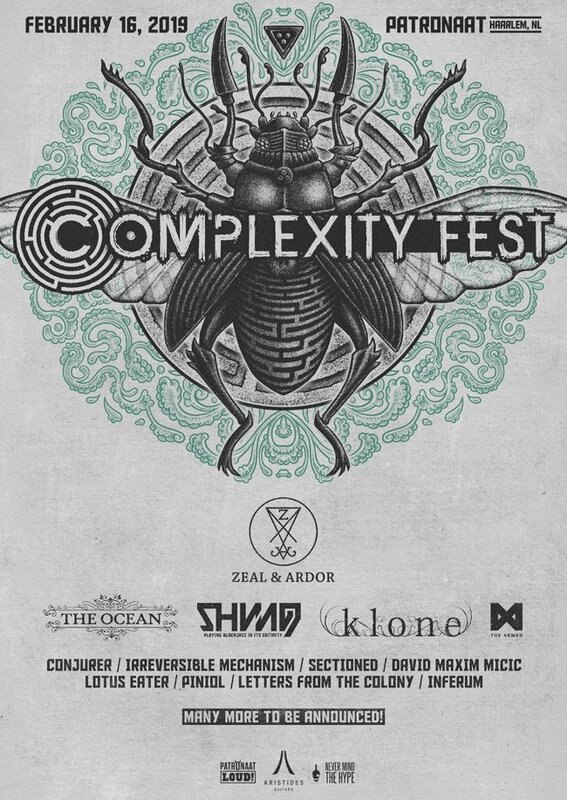 Also, follow Complexity Fest on Facebook and get excited by their upcoming announcements. Next PostKerretta Bring Out the Polish on "Chroma Queens"